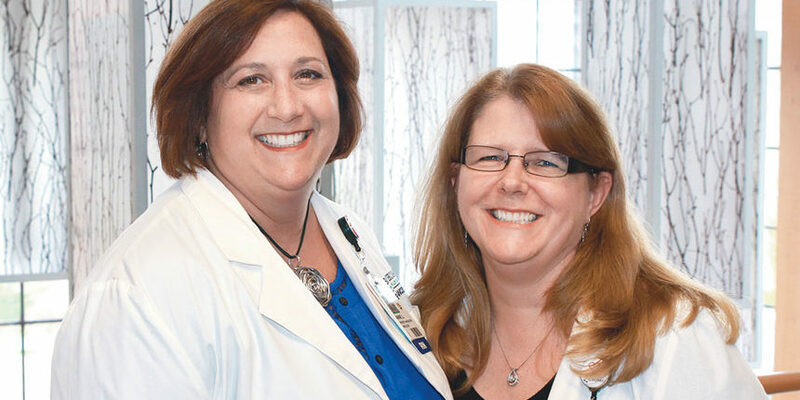 Home / Southcoast News / Health+ / What Do Patient Navigators Do? Health+: As patient navigators, do you work with specific kinds of patients or anyone seeking care at the Cancer Centers? Jeanne Maloney: We try to meet with every new cancer patient, even if it’s just to introduce ourselves, explain our role and offer to be there for them. We see all cancer types, but we work more with patients who need a combination of treatments, and patients with more complicated chemotherapy regimens and regimens that tend to have more side effects. We also work with patients who have diverse needs and can benefit from additional support to get through their treatment. Health+: What kinds of things do you do for patients and their families? Anne Lawrence: We help patients in a variety of ways, from managing their appointments to reminding them to take their prescriptions and providing information on their treatments. It is our job to help patients sort out the next steps in their care. The many appointments, tests and X-rays that are necessary in order for patients receive their treatments can become overwhelming. We are here to guide them through it. JM: We try to get all tests and procedures done in a timely manner so patients can start treatment as soon as possible. We do a lot of education with patients and family members regarding the need for testing and procedures, on the chemotherapy regimens they may start, on side effects they may have, and how to minimize side effects. We also work closely with social workers and nutritionists to help patients as they begin treatment. Health+: Why are patient navigators important for patients? JM: The goal of the navigator is to reduce the time to diagnosis and treatment through education, awareness and support. The sooner we can start a patient on treatment, the better the outcome for the patient. Through education, we can help patients stay healthy throughout their treatment. We work closely with our Community Outreach Coordinator, doing education in the community, speaking at different events in the area. We also help to run support groups at each cancer center in Fairhaven and Fall River. AL: When patients receive the diagnosis of cancer, it is traumatic to them and to their families. Most of the time, patients hear nothing else at their appointment, except that one word: cancer. It is important that patients have a face, name and number that they can contact to answer all of their questions and fears. I do not have all of the answers, but I will certainly find them. Sometimes a patient just needs a really good listening ear — someone who can reassure them in their time of need. Health+: In what way do you find your role rewarding? JM: The fact that I have been invited into these people’s lives at the most difficult and emotionally challenging time is so inspiring. I have met some of the most courageous, thoughtful, funny and endearing people. If I can be of any help — even in its smallest element — to make this journey less painful or difficult, then I feel very gratified in that. AL: It is a privilege to be part of such a personal time in patients’ lives. It is unbelievable the courage, strength and determination that these patients show to us and each other. For more information about cancer care, visit Southcoast Centers for Cancer Care or call 877-822-2732.